Contact us if you require more detail and we can generally make this application for any vehicle. 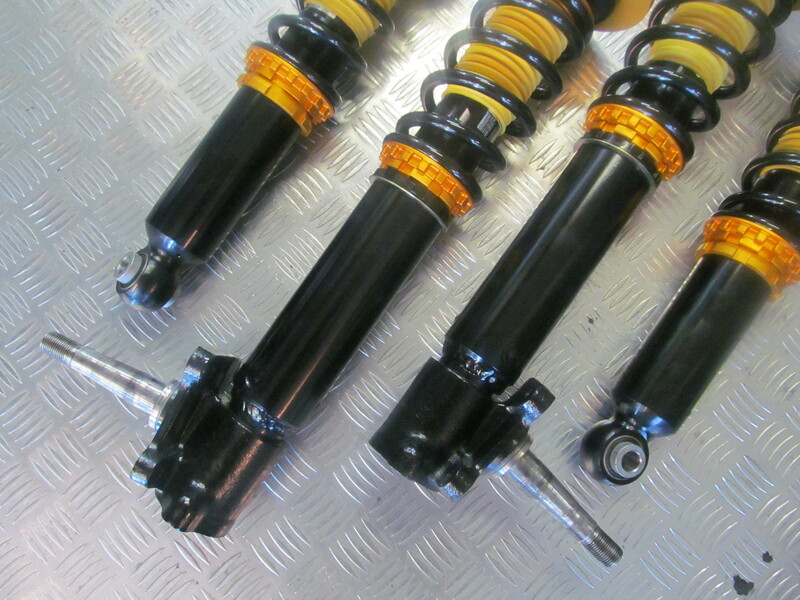 XYZ Racing adjustable coilover suspension is available in a number of different formats to suit Road, Circuit, Tarmac Rally, Gravel Rally and Drift applications. Speedfactor has developed a number of systems with the factory to enable us to tailor each set of coilovers we make or import, to be best suited to NZ conditions. 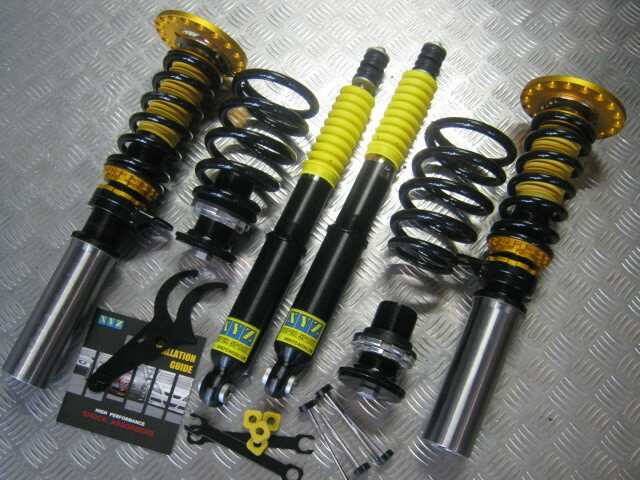 You can check to see the various shock specifications, regarding stroke, rebound dampening and top hat configurations and if there is an XYZ application to fit your vehicle by either ringing or emailing us or go direct to the XYZ website on www.xyz-racing.com. If your model is not listed we may be able to custom make a coilover set. We have available custom setups for Holden Commodore models. VB VK VL and now also VR VS live axle and IRS. 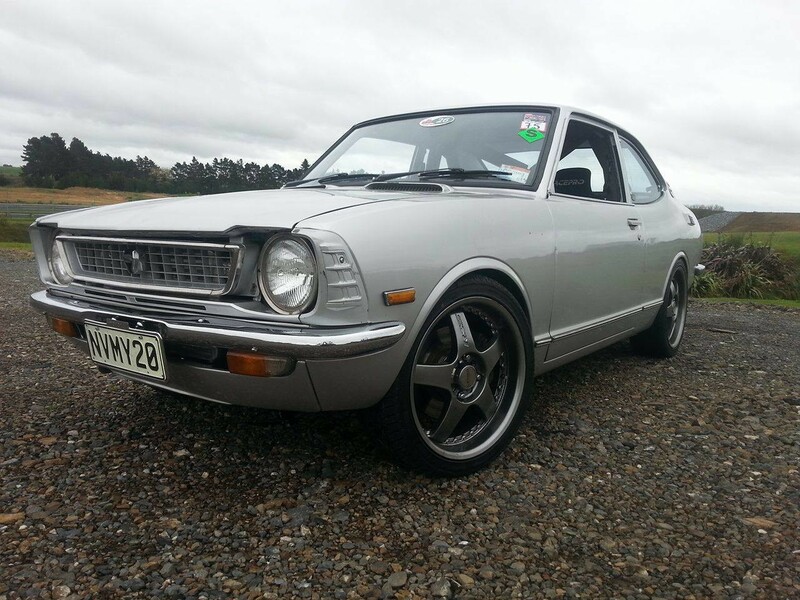 Also some we have done in the past and more recent applications include MX73 MX83 Cressida, Mazda RX7 Series 1-3 Mazda RX2, Skyline R31, Starlets, Escorts, Datsuns and all BMW's plus various old school race vehicles. We are restricted with some models due to LVVTA rules and regulations regarding steering pickup points however with some we have developed a method which we get NDT crack tested to comply with LVVTA requirements. (Applicable to all older model McPherson struts with integrated stub axels). We have an LVVTA pre approved welding method and crack test facility to enable our lower mounts to be welded to existing stud axles. 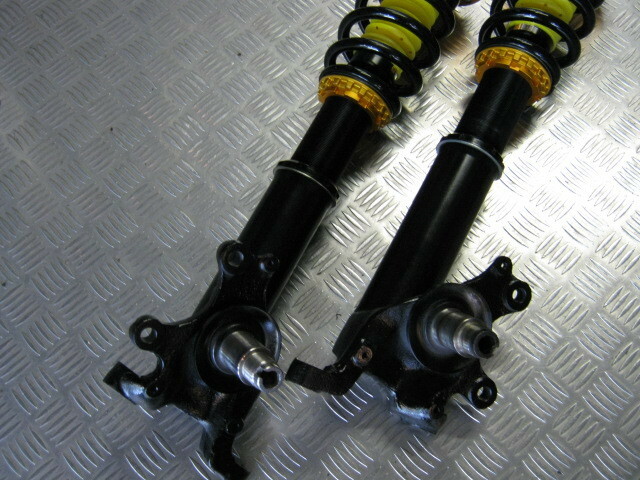 This then allows our coilovers to adjust ride height within the steel lower mount. (Applicable to all older model McPherson struts with integrated stub axles). 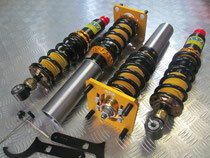 Custom coilovers to suit nearly all older design McPherson struts with integrated stub axles. Ford Escorts Holden Commodore VB to VL Toyota's, Mazda 323's RX3 etc Datsun BMW just to name a few. We have had continual great feedback from competitors in various motorsport classes and with a large percentage of BMW, and Honda racers, both North and South Island, utilising our RS Race Spec coilover kits. Also well represented in the BMW race series, with lap records and championships for various classes over the recent seasons. We offer a customer service program, enabling shock insert valving options, spring rate options and other special features to ensure we can help you you attain the setup that best suits your race application. Nearly 75% of our race options are changed and customized to suit our race circuits which has been gauged from customer feedback and our own race development. Unlike many other companies which supply a box kit which doesn't always work! We supply the coilover to give you the competitive edge! 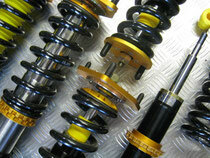 Our spring and shock inventory for racing is hugely comprehensive. We can help you choose the correct rates but also can offer a swap service if you require firmer or softer spring rates. 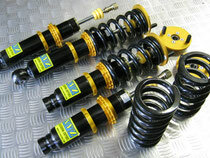 For the ultimate circuit race coilover we offer external reservoir Circuit Master coilovers. This is XYZ-Racings most advanced design for competition. With many years of development and testing throughout the XYZ network, the Circuit Master Damper is tested via XYZ racing teams all over the world. 9720 ways of different adjustments enables the ultimate in fine tuning performance from a dedicated, state of the art damper. The winning edge! Installation and ride height adjustments are easily carried out. 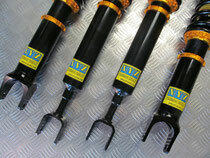 The advantage of XYZ-Racings' design enables ride height of the vehicle to be adjusted from the lower mount of the shock attached to the chassis, rather than spring perch. This enables maximum stroke in the shock absorber at all times to enable the same dampening characteristic at various heights. The shock absorbers threaded body, threads up and down inside the lower mount so no need to adjust spring perch etc. Major advantages with corner weighting and maximizing ride quality with these systems. With early McPherson strut designs, you weld the lower steel threaded collar to the existing strut tube/stub axle and the shock can then be wound up and down inside this mount to control ride height. 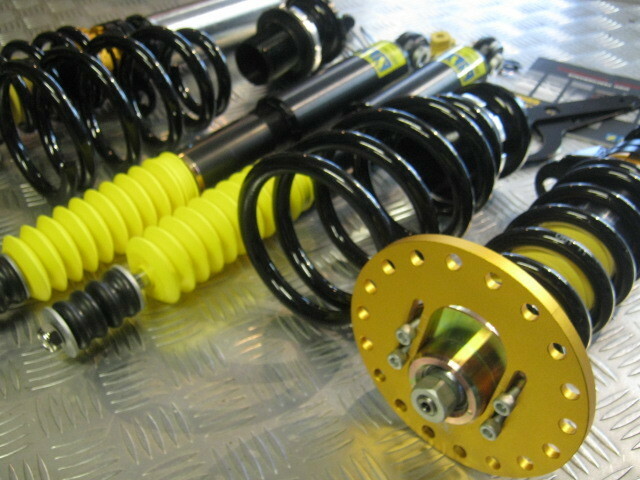 We can carry out all installations of our coilovers. LTSA require a crack test report for any welds that carry vehicles weight. We can carry out all welding of struts to the LVVTA certifiable standard, including crack test report, required for road going vehicles. Please contact us with you're vehicle specific and we can provide you with more information.